“Flying” to a feeder near you? One of our volunteer naturalists recently shared a story of an exciting discovery she made at her bird feeders. She loves to tell anecdotes about the slew of birds that frequent her backyard feeders during the day. However, this time her visitors were not birds, and they appeared in the middle of night. She had seen odd things at night when passing by the windows that looked out towards her yard: a bird feeder swinging wildly with no wind and shadows cast by the moonlight that moved in a herky-jerky scuttle up nearby trees. 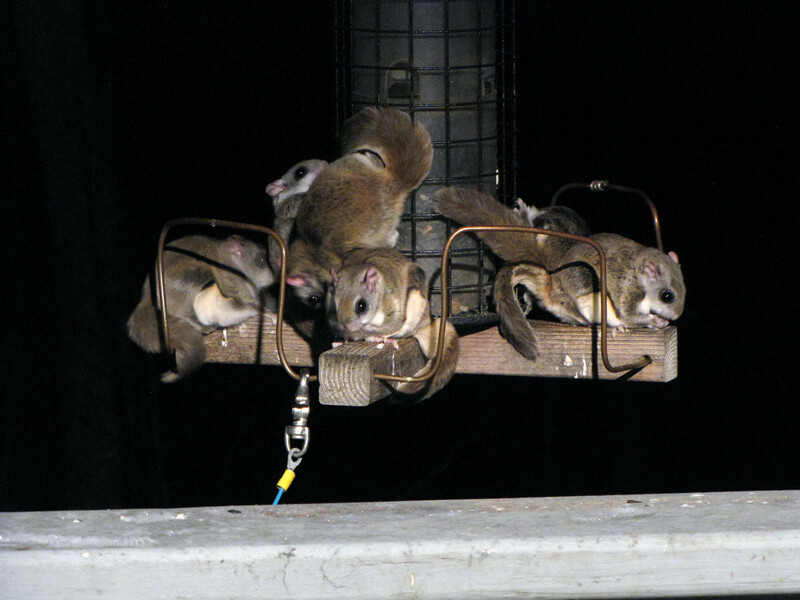 It wasn’t until one night this winter, with the flick of a light switch, that she caught these mysterious critters in action: Frozen in the glare of a flood light, a dozen southern flying squirrels (Glaucomys volans) perched on her bird feeder, gorging themselves on sunflower seeds. The bulk of a flying squirrel’s diet consists of seeds, nuts and fruits; although, they won’t turn their nose up at insects, bird eggs or even the occasional animal carcass if they happen upon it. Because these nimble woodland mammals are strictly nocturnal and spend most of their time 20-30 feet up in the trees, flying squirrels are rarely seen. Most people are only lucky enough to experience flying squirrels by hearing bursts of their high-pitched “tseet” calls in the darkened woods. In addition to these audible calls, other sounds made by flying squirrels are ultrasonic and may function as a type of echolocation, guiding the squirrels towards good landing spots. Although rarely seen, these small gliding animals are found in most oak-hickory woodlands throughout Lake County, Illinois. A southern flying squirrel is similar in size to an eastern chipmunk, and most school children will correctly tell you that a flying squirrel does not actually “fly.” Rather, it uses the layers of loose skin along each side of its body to glide through the treetops. They typically glide at a downward angle of 30-50 degrees for a distance of 20-30 feet (although, the farthest distance recorded is 150 feet!). When gliding, these squirrels can maneuver in the air, twisting and turning in 90-degree angles to avoid branches and avian predators, such as owls. Southern flying squirrels also have extremely large eyes that aid their vision in low light and tiny whiskers called “vibrissae” on their cheeks, chin and ankles to help them navigate at night. 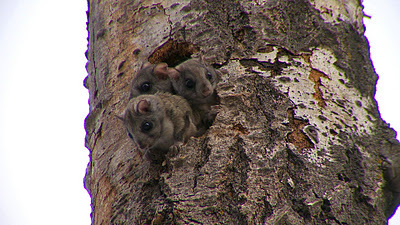 Southern flying squirrels have two breeding seasons, the first of which falls in February and March here in Lake County, Illinois. 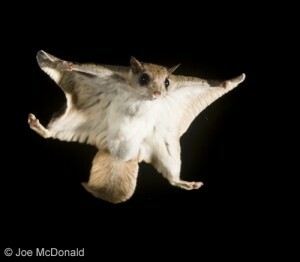 This time of year is a good time for observing flying squirrels. In addition to their courtship displays, these gregarious critters tend to congregate in groups of up to 20 squirrels in a single cavity (often an old woodpecker nest) for warmth at the end of winter. Watch your bird feeder and you may get lucky with midnight visitors in your own backyard. The best way to hear and possibly glimpse flying squirrels in the Lake County Forest Preserves is to visit in the evening. While most of our trails close at sunset, two solar-lighted trails stay open until 9:00 pm daily through March 30th, 2013. This entry was posted in mammals, nature, wildlife and tagged backyard, bird feeders, birdfeeders, courtship, fly, glaucomys volans, glide, Lake County Forest Preserves, rodent, southern flying squirrel, spring, squirrel by lakecountynature. Bookmark the permalink. Glad we could solve the Christmas night mystery in your house Lynn! Fascinating to watch them in action. How interesting, I had no idea Lake County had these animals! Amazingly, southern flying squirrels can be found throughout the entire eastern part of the U.S. from northern Wisconsin to southern states such as Louisiana. Thanks for reading Joan! We’re in Gurnee and have had one come almost every night (February-March) to gorge on our bird feeder’s contents. He’s really friendly & has let me get close because I thought he might be someone’s lost sugar glider pet. Have one at a oiler feeder tonight in mundelein. Was able to get within 5′ of it to take some pics and video. Video from phone was poor since low light though. We have baby flying squirrels in our birdhouse in Grayslake. At first we thought they were just squirrels until we noticed the extra skin on their sides. We’ve seen four of them but we’re pretty sure there are more in there. We are hoping the resident hawk does not find them! Is anyone selling this feeder or have the plans to make it? That is a fairly typical thistle feeder for birds. Squirrel visitors were a bonus. We have at least 3 that live in a tree in our front yard. We see them most active around dusk. They eat, fly, and play with one another. They love my peanut feeder. They are comfortable around us. They will let us get close with a flashlight and the noise my 5 year old grandson doesn’t seem to bother them. They are beautiful and so fun to watch. I make sure their feeder never goes empty. I also have sunflower feeders as well as suet and other seeds. I have never seen them approach those. Hi, Tracy. Thanks for sharing! That must be so exciting to watch! So glad you found our post and took the time to comment. Cheers! We live in Long Grove, lake county Illinois. Unfortunately our first experience with flying squirrels is in our attic! We had a wildlife trapper get one so far, and has set other traps today. They’re welcome on our bird feeders but please say out of my home! Now we have to find where they’re entering! How exciting! Did you get any photos? the past week ive had one visit my feeder. just looked it up to find this info. i got to see it climb and fly in my trees. now i know what to look for. pretty cool.